Really Reasonable Ribbon Blog: Glassine Bag & Card with RIBBONS! 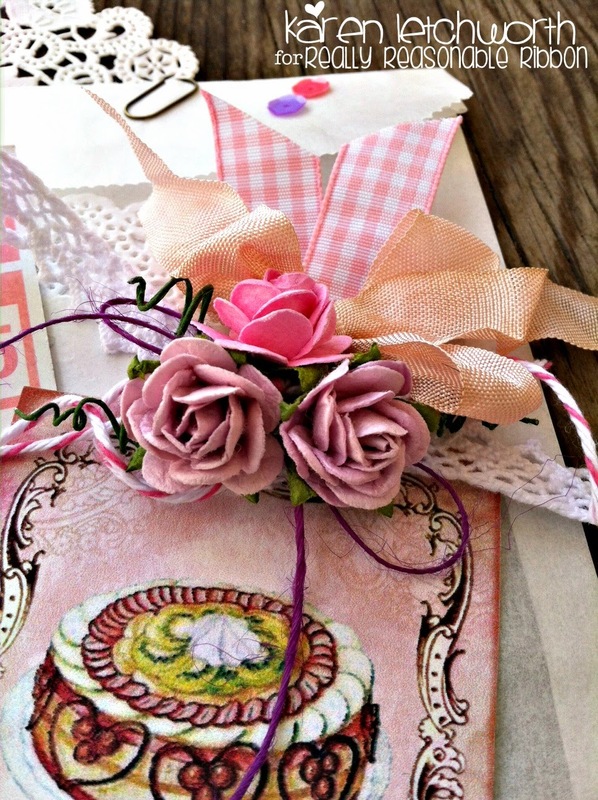 If you're anything like me, you simply can't resist putting ribbons, laces, bows and trims on all your projects. The best place to find these ribbons and trims, at REALLY reasonable rates, is right here at the best little ribbon shop around......Really Reasonable Ribbon. They carry SO many fabulous ribbons and trims, as well as flowers and embellishments to adorn your projects. If you haven't visited the store lately, you'll definitely want to check out all the great new ribbons, and all the recently restocked items. They carry ALL the popular styles, widths, and textures. 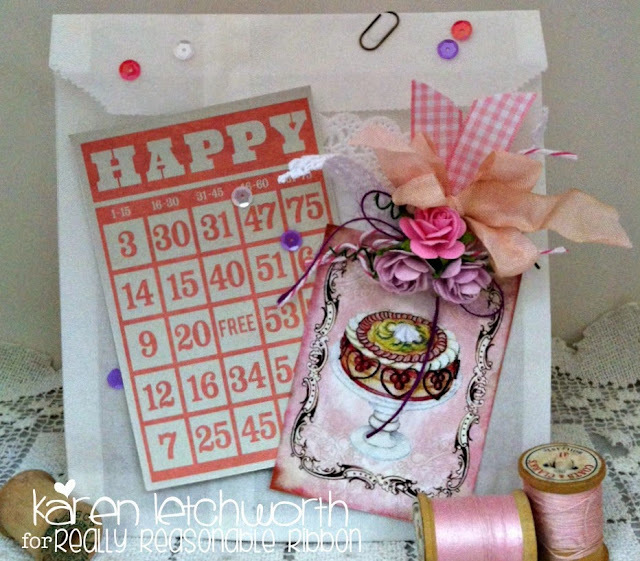 Just look at how my Really Reasonable Ribbons supplies helped me to decorate this sweet little glassine bag and matching card. I love using glassine bags for giving homemade goodies such as cookies, brownies, or even candies. I added a digital image (cake), half a doily, and a BINGO card. Then, I added some sequins, Helen White Crochet Lace, 3/8" Light Pink Gingham Ribbon, Rose Petal Seam Binding, Raspberry Baker's Twine, Violet Burlap String and also embellished with Wild Orchid Crafts Open Roses in Pink and Open Roses in Dark Lilac. Do you see what I mean about how these lovely products easily make projects look amazing? It's easy when you have the right embellishments, and Really Reasonable Ribbon has it ALL! 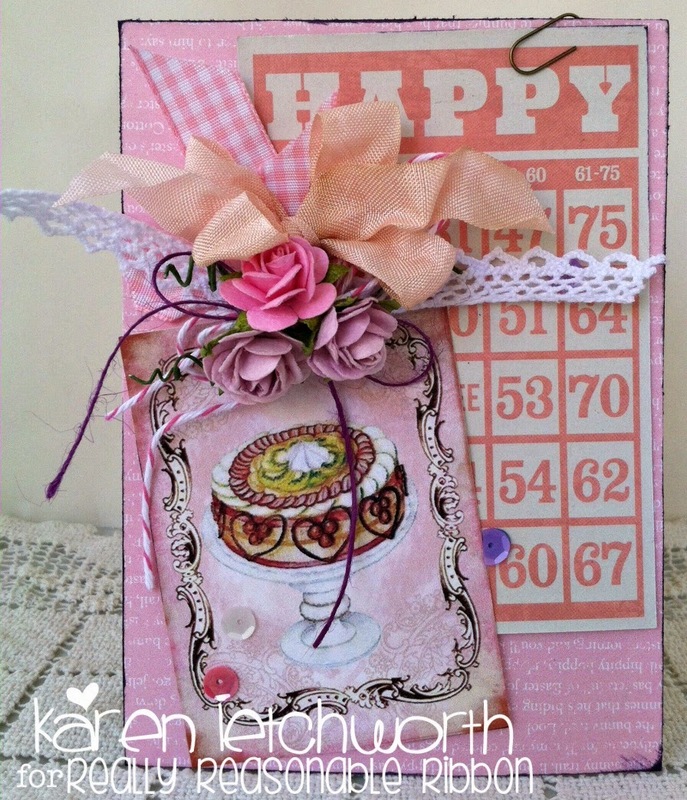 This card (below) uses all the same ribbons and flowers as listed above. This way, you can put some cookies or treats in the glassine bag, and still have a matching card for gift-giving. Really Reasonable Ribbon has EVERYTHING you could possibly need to create a lovely set like this. Thanks so much for stopping by. We hope that you will join us for the current challenge on the Really Reasonable Ribbon Blog. We love seeing your fabulous projects, and appreciate having you play along with us.